One of the most agonizing tasks for a winelover, aside from racking your brain for all kinds of exotic aromas that you can supposedly find in a wine, is coming up with a food pairing that elevates both wine and food. All too often people are enjoying a meal in a restaurant, absentmindedly sipping from their glasses whilst only discussing the food. A good food-wine match is however a conversation driver and almost demands to be noticed, to be placed in the spotlight. A lot of sommelier studies fail to reach beyond “red with meat and white with fish”, and everything that doesn’t fall neatly in these very broad categories is up for grabs. Sure, sometimes you will see an exotic pairing but chances are that it is but a forced attempt at something novel. In class, a wine is analysed to death on flavour, texture, finish, production method, but only in rare cases on proper food pairings, let alone the circumstances under which you would recommend popping the cork. As a lot of wine educators are first and foremost winelovers and not necessarily food professionals, this remains a knowledge gap that needs to be filled. If a sommelier were to excel at his or her job, food knowledge is paramount. The required depth of this knowledge is up for debate but cutting corners is not recommended. A sommelier needs a deep understanding of what exactly brings a dish together in order to pair it with the perfect wine. Only by seeing wine as a fundamental part of a dish, not of a menu, not of an experience but as a component in a creation can you come to a good match. This is why we rarely hit a homerun with a wine we pick out ourselves in a restaurant, as it’s basically taking an educated guess on the exact dish you will end up with. Luckily more and more chefs want to be involved in the selection of wines to pair up with their style of cuisine. Vilhjalmur Sigurdarson of Souvenir in Ieper is the type of chef who does not compromise on his food and the natural wines he pairs it with. After gaining experience in restaurants such as Texture in London, Hertog Jan in Bruges or In De Wulf in Dranouter, it was love that drew him to Ieper, settling with his wife Joke and opening Souvenir about a year and a half ago. On the surface, the food is deceptively simple with two or three key ingredients. It is only when you start that all the little touches pair up perfectly with the main ingredient. Whereas a lot of restaurants fall into the trap of having a lot going on in a dish without really being about something, this is not the case here. We started with a deliciously tender tomato with crunchy radish and Belgian rapeseed oil mayonnaise. Upon recommendation we paired it with Les Chamois du Paradis 2013 by Ganevat, a revered natural wine producer from the Jura whose wines seem to be more available on social media instead of in an actual store. The wine works because it is complementary with the dish, a creamy sensation in the mouth countered with a punch of acidity towards the end, and a clean finish that leaves room for the spiciness of the radish.I think that you can do true justice to natural wines by pairing them up with food. If tasted in isolation, I am sometimes disappointed by the lack of identity or origin. It may be the winegeek in me but I do get a kick out of guessing where a wine comes from. Natural wine can throw all preconceptions of origin right out of the window and end up being more about vinification technique than wine. When you look at them in the context of food however, they can be more versatile than ‘traditional’ wine pairings. The Heimat Silvaner 2013 by 2 Naturkinder is an example of a wine that is indistinguishable in its origin. Blind, none of us would have guessed Franken, let alone Germany or even Silvaner for that matter. Cloudy from the start, unfiltered, malolactic fermentation and extended lies contact led to a creamy wine, more on damp, earthy aromas than on fruit or fragrance. Texturewise it was a good match with what was one of my favourite dishes, langoustine with pumpkin and corn, as the rich and vibrant flavours were enhanced by the wine. I would however not have enjoyed the wine as much without the food though, as it did come across a bit unhinged. A composition of red peppers, beetroot and cabbage called for red. The Quarterons 2013 by Etienne and Sebastien Riffault is a staple of the natural wineworld and rightly so. I am in general not a fan of Sancerre pinot noir, too often lacking in substance, but this had a grounded earthiness on the palate while retaining the elegant floral hints from the nose straight through to the finish. The combination came across a bit iffy at first I have to admit, but the snappy seeds as well as the delicate sweet raspberries went surprisingly well against the creamy red peppers. 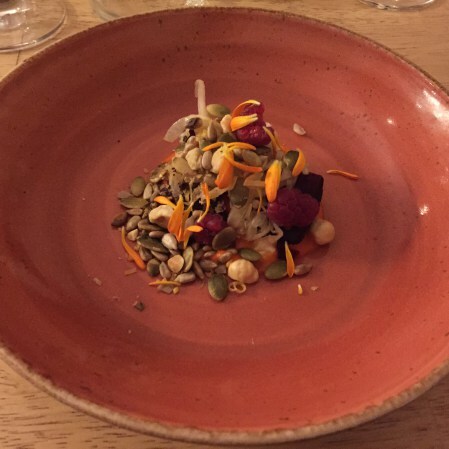 It was thoroughly enjoyable, even being perhaps the most complex dish of the evening; it was still very focused, more on texture and overall mouth sensation than individual flavours. When we finished our six-course menu as well as a couple of bottles of wine we were all surprised that we did not feel stuffed or completely full, yet none of us could muster up the courage to eat anything else. This was one of those rare meals that simply leaves you with a sense of satisfaction, seemingly coming to a natural end without overreaching or going overboard. The style is a prime example of pure and simply good food, showcasing simplicity that effectively hides layers of depth in flavour so subtle that they can only work best as part of the whole dish. 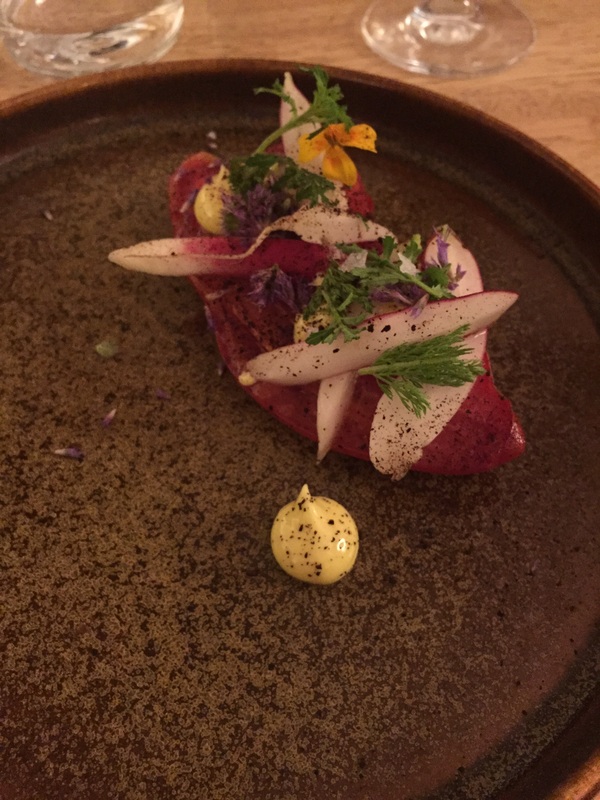 This, in combination with a winelist that does not get too lost in the hipster fad of the day shows that Vilhjalmur and his lovely wife Joke are rising stars on the Belgian gastronomic scene, and a reason to visit Ieper!